So reads the opening titles of Jack Quick’s new true-crime documentary. A skilled producer, Jack knows that the bigger the conspiracy, the higher the ratings - and he claims Curtis Wade was convicted on flimsy evidence and shoddy police work. Millions of viewers agree. Just before the final episode, Jack uncovers a minor detail that may prove Curtis guilty after all. Convinced it will ruin his show, Jack disposes of the evidence and delivers the finale unedited, leading to Curtis's eventual release. Then a new victim is found bearing horrifying similarities to the original murder. Has Jack just helped a killer walk free? Determined to set things right, Jack returns to Birravale looking for answers. But with his own secrets lurking just beneath the surface, Jack knows more than anyone what a fine line it is between fact and fiction. Between life and death. Now there's only one option left. The truth. There's a something about GREENLIGHT that feels like a non-too-subtle dig at the commercialisation of true crime. There's always been a sub-set of true crime writing that's been about the crims, their exploits, personalities and too big to be believable criminal histories. Ranging from reflective and analytical in style, to tongue in cheek, many books and programs seem to have contributed to the rise of the "celebrity criminal". It's no surprise then that the rise and rise of the true crime investigative journalist is increasingly leaking over into the crime fiction realm, with GREENLIGHT by debut Australian author Benjamin Stevenson introducing documentary maker Jack Quick doing a major TV program on the murder of Eliza Daley. Not exactly a cold case, this was supposedly solved, the owner of the property where her body was found already convicted of her murder. Starting out with the chilling final moments of Eliza's life, as the walls of the cellar she's been held in start to "bleed", GREENLIGHT then switches to the final episode of Jack Quick's TV series, and doubt being cast on the conviction of Curtis Wade for her murder. Once Wade is released, it takes the copycat murder of his defence lawyer to trigger a crisis of confidence in Quick and his return to the small winemaking region around Birravale. Whilst there is much to be made of the true crime industry, GREENLIGHT doesn't lose track of the core crime fiction component of solving an actual crime. In this case the murder of Eliza Daley is treated as a part cold case and part possible miscarriage of justice, with Quick starting out assuming the later, and things rapidly taking on the hue of the former. The murder of Wade's defence lawyer ramps things up substantially, with the idea that Quick's program may just have allowed a killer to walk free, but it also creates a more immediate sense about the investigation - it's a current case that is in the focus now, with echoes back to the murder of Daley. 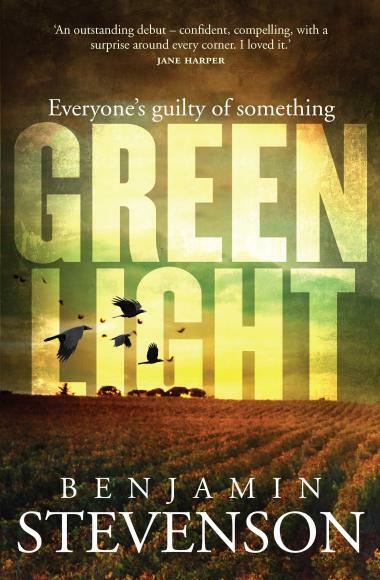 Set in a rural location, GREENLIGHT has some street cred in terms of setting and the dynamics in which the original murder took place. A predominantly wine-growing region a few hours outside Sydney, Birravale has problems. A small community, made up of original families, and blow-in's, dealing with the complications of an incoming workforce of backpackers, tourists and now, investigative journalists, Birravale daily life revolves around the pub, but the wineries bring the people and the money in. Adding to the mix in this novel is the "hero" of the piece as a flawed individual in his own right. An accident in their teenage years has meant that his older brother is comatose, cared for by their father, the circumstances of his brother's accident aren't clear but it's obvious that there is something very traumatic happened to them both. It has triggered bulimia in Quick, a condition that's rare in males, and the source of many complications in his life and relationships. As the story of Eliza Daley's murder plays out, Quick's personal story is revealed, balancing nicely, explaining much about his behaviour, rounding out the reader's connection and understanding of both. Playing with this cast of characters, their connections, the things that bind them and drive them apart, there's a great sense of small community, shared and private secrets, and people searching for ways forward. The plot is fairly laid out, allowing the detective readers to solve the mysteries along the way or simply ride along with Quick as he searches for the truth. Well paced out, populated by flawed but approachable characters, set in a location that doesn't feel manipulative or convenient, GREENLIGHT is about crime, greed, money, influence, bad decisions and human frailty and nastiness.